Elizabeth Ramsbury is only interested in pursuing her independence and her musical talent. Unfortunately, the entrapment of matrimony looms over her head like a bad omen. After her father forces her hand, she sees no other choice but to take the only honourable route and find a suitable match to marry. A fortuitous meeting at a ball leads her to make an elaborate plan with the Baron to convince everyone that they are courting. What happens when their scheme paves the way for true feelings to start blossoming? Will Elizabeth realize that she can find the love and passion music has given her in a different place too? Lord Cavendish, Baron of Bedford has been rejected by his only true love. Dejected and heartbroken, he mourns the loss pitifully. He believes that he can only be whole again when he wins her back. His prayers are answered when a beautiful woman he meets by chance gives him the perfect opportunity to make his lost love crawl back to him. But he soon finds himself unwittingly enchanted by her grace, beauty and pleasant company. What if what he&apos;s looking for is right in front of him? It may have been pure chance when they met for the first time, but is it fate that will bring them together? Sometimes love can be found when you least expect it, even in the best-laid plans! Will they both realise that their goals, as well as their hearts perfectly aligned? "A Courtship to Remember" is a historical romance novel of approximately 80,000 words. No cheating, no cliffhangers, and a guaranteed happily ever after. Another charming story from a great writer. Being forced to marry or rejected and having is untrustworthy sister make it a great plot. Well worth reading. 5.0 out of 5 starsAlways: what would happen to their attraction? Another charming story from a gifted storyteller. Attraction between strangers can be fleeting, or it can become something ever lasting. What will happen in this romantic story filled with misunderstanding and guesses, instead of plain speaking of emotions? This is a very interesting story, filled with characters well described in the narrative. I enjoyed reading this story, and recommend it to others. Well done. Elizabeth has never wanted to marry. She only wants to be left alone to pursue her music. When her father tells her she must accompany her sister to London for the season and find a husband she is devastated. If she doesn't agree, he will find one for her because she must marry on order for her younger sister to marry. Anthony, the Baron of Bedford, proposed to Diana, the woman he has loved and devotedly courted for six years. When she rejects him and humiliates him by telling their friends how she laughed in his face and cruelly broke his heart, he decides to hide in his room and drink his humiliation away. After nearly two weeks, his best friend drags him out and forces him into London for the season. When Elizabeth and Anthony meet at a ball, after speaking privately, Anthony devises a plan where they all get what they want. If they enter into a fake courtship, Elizabeth's father will allow her sister to marry first. Due to her extreme jealousy, Diana will return to Anthony and marry him. After her return, Anthony will reject Elizabeth and her father will not force her to marry. As they say, the best laid plans...etc. When they begin spending time together they find they really enjoy each other's company. By the time Diana returns will their heart still want the same thing as when they started? I liked this story because it shows that the things you think you want may not be what you need for your happiness. This is a delightful story about Elizabeth Ramsbury, an independent, intelligent, and talented young woman who desires for herself a career as a musician instead of the usual path of marriage. Her younger sister, Cecilia, is more typical and wanted to become engaged to her love, Percy. Their father requires them to have a Season in London to see what that opportunity will bring them. Lord Anthony Cavendish, Baron of Bedford, wanted to marry his true love Diana Lambert, daughter of the Viscount of Somersby, but she laughs at him and embarrasses him in a painful rejection of his proposal. Anthony is devastated, so Felton Nicholson, his best friend, convinces him to go to London to take his mind off of his bad experience. He of course meets Elizabeth at the ball and they agree to a plan that could be beneficial to each. He will pretend to court her to make Diana jealous. In return for her cooperation, he will help Elizabeth with her music goals. It sounds like a well thought out plan – until things don’t happen quite as expected. I really loved this story line and the characters were wonderful. Do they find their happy ending? Do each reach the goal that makes them truly happy? Grab your copy and enjoy! 4.0 out of 5 starsVery pleasant love story with likeable characters. I was almost dreading reading this one, as I didn’t even finish Ms Barton’s last book. Usually I enjoy her stories, but I got so impatient over the silliness of the heroine in “A Charming Lady...” that I gave up with a shrug. This one, however, is back to her usual style: Elizabeth is intelligent, charming and natural; Anthony , though a bit of a schmuck in wanting his selfish and hateful old love back, is sweet tempered and kindly. Their decision to enter into a false courtship in order to incite the woman who jilted Anthony to jealousy and to get Elizabeth’s father off her back regarding marriage wasn’t as implausibly written as that scenario often appears in other books. Of course, the couple doesn’t see for a while what the reader can see instantly...the perfect match in the making! Only two criticisms. One is that Elizabeth was seen as beneath Anthony in station since her father held no title, but in actuality the title of Baron was not so high that anyone would see his marriage to the daughter of landed gentry as unusual. Landed gentry were NOT considered commoners. The second fault was that the extended epilogue was not really necessary and added little to the story. In fact, I found the new relationship between Elizabeth’s parents, who had disliked each other for 20 years, to be the only improbable slice of the book pie. All in all, a nice and enjoyable story about two nice and enjoyable young people finding happiness with each other. 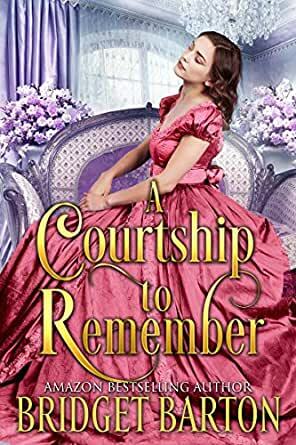 A Courtship to Remember is a good title but I found this book so tedious and repetitious I barely was able to plow through it. It was as if the author had a list of every Regency cliché, spread them liberally, and moved on to modern ones. The grammar errors were not many and probably not glaring except to the members of the Grammar Police. Since I'm a card-carrying member of the force, they stood out to me. This book has little to recommend it, unless one needs something to read in case of insomnia. Elizabeth and her sister are sent to London to find a husband for Elizabeth. She, however, isn’t interested in marriage as she wants to devote her life to her music. Her parent's marriage has shown her that a woman is required to put her talents aside for her husband and family. Anthony is in a deep depression because the woman he has been courting for six years dumped him after he proposed. The characters were immature, self-delusional and annoying. The main characters were at their best when they were together but that wasn’t enough to overlook his stubbornness and lack of backbone and her insecurities.